I have a soft spot for old-fashioned desserts, especially if I first read about them in one of the books I was always devouring as a child, and even more points if they have a funny name. Cobbler, clafouti, trifle, betty- and fool- are all irresistible. With all of the gorgeous fruit arriving in the farmers market, it is impossible to beat the cool simplicity of whipped cream and fruit compote and the classic combination of rhubarb with strawberry is a freshly tart contrast to the mellow richness of cream and creme fraiche. Toss the chopped fruit with the sugar and allow it to macerate for a few minutes. When the juice starts to seep out, pour all of it into a shallow saucepan and stew gently over low heat until the fruit is softened and bubbling. Keep the temperature low and an eye on it so that all of the liquid doesn’t cook out and the fruit scorch. When it is soft enough to mash into a chunky puree with a fork, take the fruit off the heat and cool. The fruit should not be smooth- it should still have some chunks so that it doesn’t completely incorporate into the cream, offering a little contrast between tangy fruit and cream in each bite. Cool the fruit completely and chill. This part can be made a couple of days ahead. In a large bowl or in the bowl of a large mixer, mix the heavy cream and creme fraiche and whip to stiff peaks- when the whisk or beaters are pulled upward out of the cream, the cream holds it’s shape in a stiff peak. Pour the fruit into the whipped cream and gently swirl it into the cream- think caramel swirl in ice cream- by folding the fruit in with as few strokes as necessary. 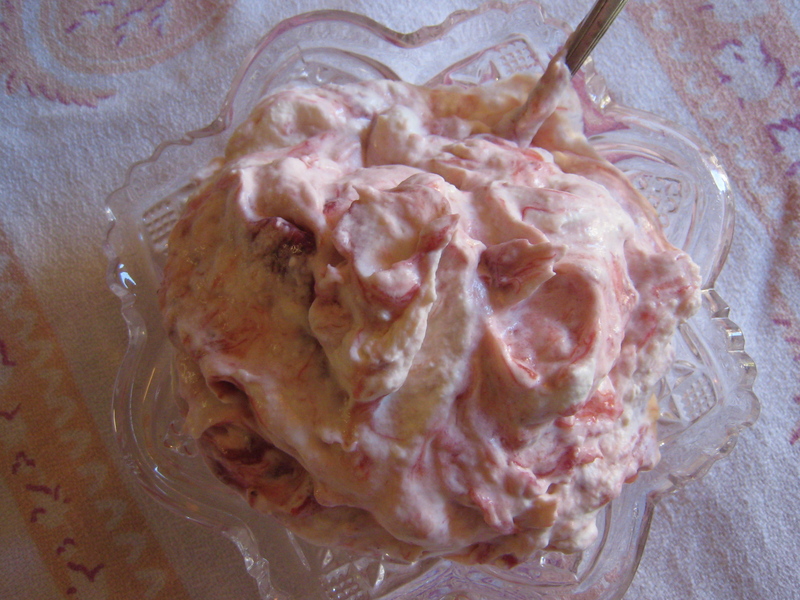 Spoon the fool into a large glass bowl (maybe a trifle bowl) or individual serving bowls. It’s a simple dessert, almost like unfrozen homemade ice cream, and I can imagine all sorts of possibilities as the weather heats up. Blackberry fool, anyone?